The Air Huarache Run Ultra kids' trainers from Nike takes the classic to new levels of comfort. These black and white runners have a three-layer mesh and perforated foam upper for air flow and breathability. The textile interior secures healthy inner climate. An elastic strap and rubber cage on the heel delivers a snug comfort. Kids' trainers with no-sew overlays on the toe and quarter for a sleek look. The insoles and ankle collar provide cushioning all-day comfort.Injected unit midsole doubles as an outsole to reduce the overall weight of the shoe. 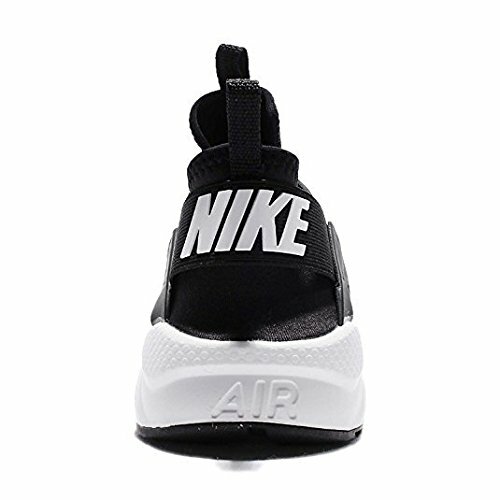 These kid's runners feature foam sole with Nike Air cushioning for lightweight comfort. The waffle outsole pattern has rubber pods strategically placed for durability and traction.